It is 2016, summer has arrived to the northern hemisphere. It is one of the many cycles that human has gotten accustomed to. And it seems also that some summers are hotter than the others, and some cycles are harder for mankind to recognize and adapt to. Talking about financial weather, there have been endless financial resets through out human history, from roman empire currency debasement, to Chinese Song Dynasty Iron Standard, to Weimar Republic hyperinflation, to lately Venezuela crisis. Each time Gold has always managed to arise from the ashes, preserving wealth and providing confidence to the market. We have been in a fiat money region, that is money backed by confidence in sovereign governments especially dollar as world reserve currency, for the last half century. After dot com bubble, 2008 housing crisis and recent rise of the negative interest rates and endless monetary stimulus from central banks, maybe we should ask are we in the end of the monetary system cycle, hence a financial reset? Is this summer any different? Gold comes back in 2016? Gold in 2016 has been the biggest winner of all asset classes, after had been in a multi-year bear market, all the way down from all-time-high $1889.70 in 2011 to the all-time-low $1050.80 in 2015. The sentiments are overall still skeptical if not calling a top already for the year. However there are already some high profile personnel turned bullish on Gold, notably legendary investor George Soros, closely followed commodities investor Dennis Gartman, famous hedge fund manager Stanley Druckenmiller. And the list is growing by the day. In this April, famous gold and finance commentator James Rickards released a new book named The New Case for Gold. In his book, he is calling for $5000 per ounce of gold as way of mitigating the coming financial crisis. Like Rothbardian Gold Price, FED would print money and use them to revalue gold through open market gold buying spree, and pay off all FED liabilities on balance sheet except Federal Reserve Notes and commercial bank deposits at the FED. The difference is that Rothbard would advocate go back to 100% gold reserve ratio, while James sees no reason of removing the flexibility of revaluing from the FED. While it is easily to get into the philosophical debate about the legality/soundness of fractional reserve banking, we ought to also firstly acknowledge that historically it is the centralization of banking power leads to inevitable corruption and self-destruction. Instead of arguing would a 100% percent reserve ratio provide stability, maybe we should is it possible not to have a de-centralized banking system? The rise of Bitcoin and its technology behind it, Blockchain, provides a decentralized computing paradigm that could easily support a complicated financial system like ours. Combing Blockchain with IoT (internet of things), which connects personal hardware to the internet, would might just be able to build a first global decentralized currency backed by Gold. You can think of Blockchain as a computer that is supported by other ordinary computers(called miners) across the internet. If we call Microsoft Azure, Amazon Web Service, Google Computing Service as “private cloud”, then Blockchain is a “public cloud”, where no private interest can directly influence the result. An distinctive trait of a Blockchain Computer is that, it is nearly impossible to hack(usually requiring controlling > 51% of its miners), and its data and history is transparent and immutable. This makes it especially useful for creating financial products, and bitcoin currency is basically running on such computer. There are already different Blockchain Computers on the world, most famously Bitcoin Blockchain and Ethereum. Ethereum allows generic programs run on it, technically it’s called Turning-Complete programs, this makes it exceptionally poised for building decentralized computing software. There are two ways of defending from external threats, ether having a strong centralized army or having a vast reserve of armed residents ready to fight for the community. Switzerland is one of the examples of the latter, males with ages between 20 and 30 are conscripted into national militia, and as part of that obligation, can keep their firearms at home1)https://en.wikipedia.org/wiki/Global_gun_cultures#Switzerland – Global gun cultures, Switzerland. Gold is usually stored in big vaults and major banks including central banks, thanks to the economic of scale they have where security is a big expense for maintaining a vault. However the rise of Internet of Things technology is providing a technological tipping point for the feasibility of decentralized gold vaults. 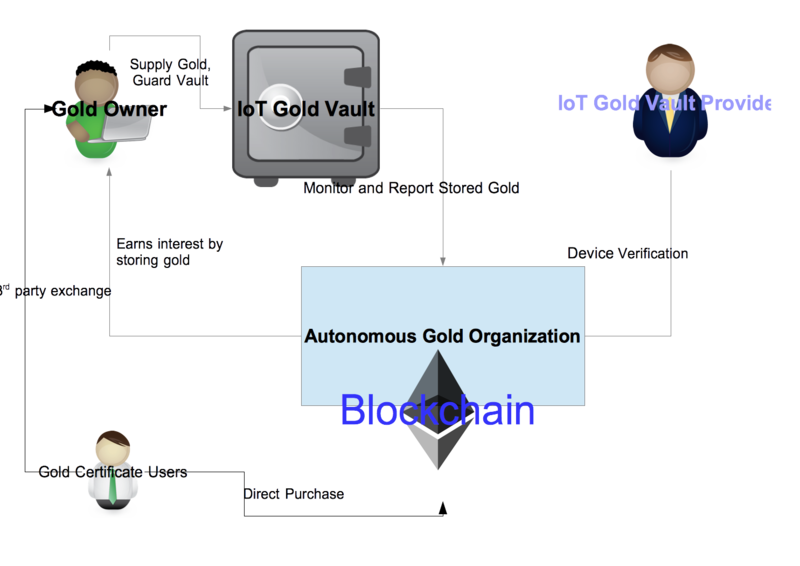 A IoT gold vault is a device that is purchased and guarded by individual gold owners, where some amount of gold will is stored and being monitored by the device. In return, they receive interest on reported amount of gold stored in their vault. 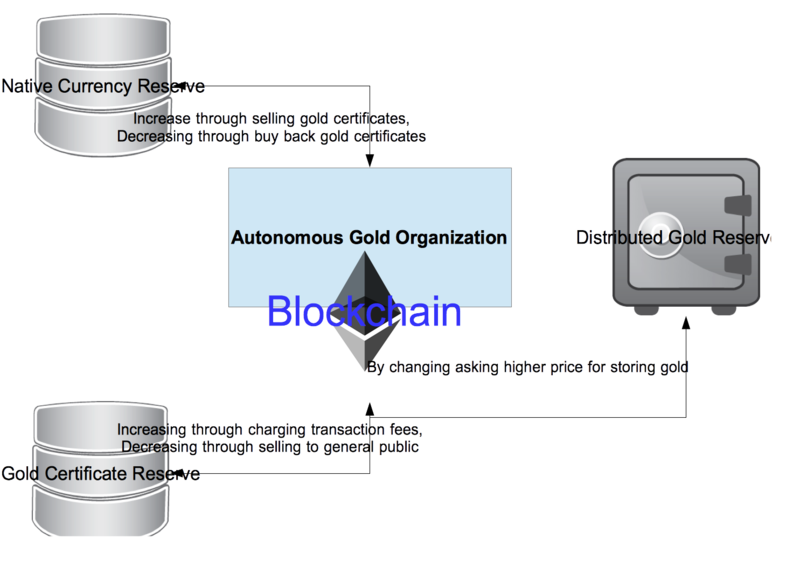 Information of the gold amount and purity will be sent to the autonomous gold organization program runs on Blockchain computer by the device periodically. There will also be number of independent IoT Gold Vault Providers who manufacture the devices. It is their interest to make their hardware reliable and hard to hack, otherwise gold owners and users could vote no confidence on dishonest or faulty devices. Autonomous Gold Organization will have to start with a money supply of 0 to certain amount of gold reserve ratio according to the amount of gold stored in gold vaults in the system. In conventional central bank, money supply is controlled through open market operations such as government bond purchases. Sell gold certificates to general public, in exchange for blockchain native currency (Ether on Ethereum2)https://www.tradingview.com/chart/ETHEUR/ – ETHEUR price). Hence native currency reserve increases along with money supply (gold certificates). Gold certificates are freely exchangeable digital tokens. Sell gold storage warrant to gold owners, who shall hold gold in vault until maturity and be rewarded with native currencies from AGO. Warrants can be exchanged, but owner of the warrants must have gold ownership that’s reported by IoT gold vaults. Hence gold reserve ratio is increased, while native currency reserve is decreased. Transactions are all going through the AGO, so that transaction fee could be applied, hence gold certificate reserve is increased. uses native currency reserve to buy back gold certificates, hence reducing money supply in the system. Increase gold storage warrant ask price, hence increasing the gold reserve ratio. AGO should provide mechanism where owners of gold certificates should be able to vote out certain type of devices for their vulnerability and, so that they will be disallowed to receive reward payment. It is in device manufacturers’ interest, and gold owners interest to make sure the devices they are using is well designed and has a good public reputation. But once the system got hacked and exposed, they will be voted out of the system. And the gold reserve ratio will drop. It is in users of the AGO’s interest to maintain a list of reputable IoT gold vault providers to make the system sustainable. Combining Blockchain technology and IoT, mankind might finally have a chance to fight against the boom and bust cycle of financial system. It is far from well thought through system yet, but it is intended to serve as a brain storming material.